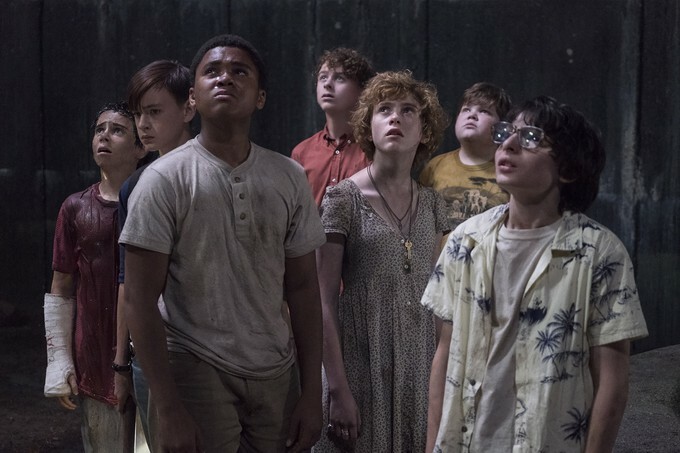 On-set interview: Wyatt Oleff (Stanley Uris) and Jeremy Ray Taylor (Ben Hanscom) talk all things IT! Ahoy, squirts! Quint here. I had a blast talking with all the Losers Club kids on my visit to the IT set last year. As a big fan of the book I was insanely curious to see who they cast as these kids I feel like I've known since I myself was 13 years old. What's crazy to me about all of them was just how naturally they seemed to fit into their perspective roles. Two great examples are below. Here is a chat with Wyatt Oleff, who plays the dry, non-believing and kinda stuck up Stanley Uris, and Jeremy Ray Taylor, who plays everybody's favorite lovesick haystack Ben Hanscom. Oleff has a few moments of Stan Uris-y dry humor (especially when answering a question about whether they know the ultimate fates of their adult selves) and Taylor's response to my question about how he plays he crush on Beverly in the movie is so dead on with the character it's like Ben Hanscom himself answered the question. One more thing to note before I start this one up. Oleff came into the room with some gore makeup on. It looked like something took him by the face... almost like something bit him around his whole head and let go. Can't swear that's what happens, but thankfully you can see the exact makeup thanks to director Andy Muschietti's Instagram photo that kicks this off. Enjoy! Wyatt Oleff: Yeah, just a little. Question: So, what happened to you there? Question: Give us a hint. Wyatt Oleff: I don't know. I'm not sure if I'm allowed to say. Question: Is this a regular day on the set of IT, being covered in wounds and seeing stuff like that? Jeremy Ray Taylor: These past two weeks have been (in an English accent) a bloody mess, I guess you could say. Question: What has this overall experience been like for you guys? Has it been everything you thought it would be? Has it surpassed your expectations? Jeremy Ray Taylor: Definitely surpassed my expectations. This has been the best experience of my life. And we're so glad it's summer! Wyatt Oleff: Well, it used to be. But yeah, I have to agree with him. This has been one of the best summers of my life, probably the best because I just made so many close friends and it's been awesome filming a movie as well. We've worked together before and seeing him again for a whole summer was mind-blowing to us. Question: Were either of you familiar with either the mini-series or the book before you signed onto the project? Jeremy Ray Taylor: Actually, I had no idea what IT was at all. Wyatt Oleff: I kind of did. I had only heard about it and my friends have talked about it, but not as much as they do now, obviously. Quint: Your characters are both very interesting within the dynamics of all the people in the Losers Club. Stan is the one that doesn't believe up until the last moment. He's the last person to complete the chain and Ben is the heart of the group. Can you talk a little about how you fit into the Losers Club, either as characters or as actors? 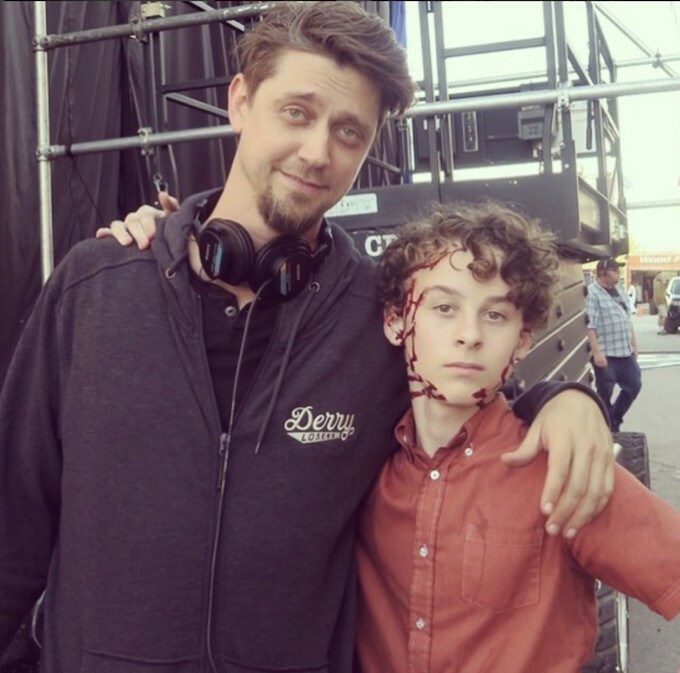 Wyatt Oleff: You could see the friendship we have on and off screen. We've been together for so long that you can see our connection, in our characters, but also it's us connecting as humans and friends. Stanley, in the group, like you said, is the last one to believe that IT is actually real because he just doesn't want to. It doesn't fit within his reality until... something happens. He relates to everyone, but he's the one who tries to organize everything, but he can't. It's falling apart for him and his friends come to support him. Jeremy Ray Taylor: Ben is the smart guy. Not that everybody else isn't. I guess you could say he's a nerd, but he's not the (pretends to push invisible glasses up the bridge of his nose) “I'm the nerd and I know everything.” But he never really had any friends and he thought that was a perfectly fine thing until he met the rest of the Loser's Club and he thought it was the best thing in the world. Question: Do you guys build the dam in this? Question: You said slime, but do you mean spit? We hear Pennywise spits a lot. Wyatt Oleff: Yeah, it's basically slime. That's what the product is called. It's called Slime. It's from England. Jeremy Ray Taylor: I had to hug him when he had the slime all over him and it got all in my hair. It was great! Quint: Was the hug centered around the big emotional moment we've heard about? Jeremy Ray Taylor: Yeah. I had to hug him and I had slime all over my hair and I love him for that. Question: Can you talk about shooting that scene? We hear it was pretty emotional, not just in the story, but for you guys as actors and people. Wyatt Oleff: That was an emotional ride, I guess you can say. The first day (of the scene), which was a Wednesday and it was more towards the end of the day. I had just finished some stuff from earlier in that scene. It was hard enough for that day because it was just a lot of flashlight shining and then we get to the end of the day and I'm bursting out in tears and I hadn't been expecting it, so it was just kind of a slap in the face. And then we did it Thursday with Finn, but (Wednesday) was the day he was on Jimmy Fallon, so we did it with Finn, but then we still had to get more shots, so we did it on Friday again. That means I cried three days in a row. Jeremy Ray Taylor: It was like, “Alright, we gotta do this scene” and the next thing you know we're all just balling out. Everybody's just crying. There was not a dry face. Wyatt Oleff: Except for Jaeden. Jeremy Ray Taylor: Well, he cried a little bit. Question: How is it like working with the clown? Wyatt Oleff: I just answered, so you go. Jeremy Ray Taylor: It's very terrifying. It's definitely an image that stays with you on screen and off screen. Wyatt Oleff: Especially off screen. Jeremy Ray Taylor: It's absolutely terrifying. Question: Why is it terrifying? What is the nature of the terror that you feel? Jeremy Ray Taylor: Well, Bill is just an absolutely amazing actor and that just makes everything ten times worse. In a good way! Question: So he's very believable. Jeremy Ray Taylor: Oh yeah. Oh my gosh. Question: Can you guys talk about the first time you saw him in his full Pennywise get up? Jeremy Ray Taylor: The first time we saw him was during a scene. They didn't show us him at all until we were in a take. Wyatt Oleff: Well, we saw him... Jack had to do something with him, so we saw him on a monitor, but we hadn't really acted with him. Sorry, I'm stealing your turn. You go. Question: When did he menace you? What was that scene like? Wyatt Oleff: Yeah, what was that scene like? Wyatt Oleff: But you will, though. Jeremy Ray Taylor: It's just absolutely terrifying and I'm definitely trying to get it out of my mind. Question: What happens in this scene you're referring to? Question: We know that Pennywise is the main villain, but another big villain is Henry Bowers. What's the dynamic between you guys and him? Is that even scarier than Pennywise? Wyatt Oleff: Like in real life? Question: I guess I mean when you're shooting. Does it get kind of intense, those scenes? Wyatt Oleff: No. I mean, they get intense, of course, but once the cameras stop rolling we love each other. Jeremy Ray Taylor: I have some huge scenes with Henry Bowers. You usually have a minute to get into the scene and I usually scream a few times to get into the moment. It does get really, really intense when things are about to go down. It does go pretty insane. Quint: It's funny you mention Pennywise scratches you on the stomach at some point. In the book at least, Henry also cuts your character in the gut. He marks Ben. Does that still happen? Is the Pennywise scratch a mirror to that moment? Jeremy Ray Taylor: Um... Am I allowed to tell him that? (Publicist gives the okay) As I was saying, I have some pretty intense scenes. That is one of them. I'm balling out because I'm trapped. I can't move because they're holding me down and I can't do anything. He cuts me on this side and (Pennywise) cuts me on this side. Quint: So, you're even then. It's balanced. Jeremy Ray Taylor: Yeah, exactly. Wyatt Oleff: I'm balanced, too (points to the cuts on both sides of his face). Right here. Question: You guys are playing characters who are growing up in the '80s. What kind of research did you do? Wyatt Oleff: My mom and dad definitely helped. They told me a lot about the '80s and what music. I've been listening to a lot of '80s music recently. That's helped me get into character... well, kind of. I made a playlist of what I think Stanley would listen to in the '80s. Question: And that would be? Wyatt Oleff: Here's the thing, I say “mail” but for some reason that take I said “email.” Then I said, “Email? What's email?” Then we turn around because we have to turn around to Bill and we all turn around and our faces are cracking up. We just bursted out laughing. Question: We heard about the sort of bonding weeks you did before shooting. They said they were really encouraging you guys to go bike riding and get outdoors. Was that helpful? Jeremy Ray Taylor: Definitely. I feel like the first week that we all met each other... I feel like we could have been friends for 20 years, that's how good our chemistry was. Wyatt Oleff: Yeah, by the third day it, it was a Saturday, and we had a sleepover. Jeremy Ray Taylor: Yeah, automatically, we were like “Everybody want to sleep over at this guy's house? It was really good.” We were really good friends. Wyatt Oleff: We still are. Like I said earlier, I think that translates on screen. Question: You guys have about a week left of shooting. What's that like knowing you're coming toward the end? Jeremy Ray Taylor: It's getting really sad. Nicholas Hamilton (who plays Henry Bowers) just wrapped and we're all missing him. We were actually just talking about that. Wyatt Oleff: I definitely cried. (Looks down at all the recording devices) Don't spread that around. (laughs) I absolutely cried. It's been an amazing experience. I know you (Jeremy) would say the same. We all would. Its' been quite the journey. Jeremy Ray Taylor: It's definitely, by far, been the best summer of my life. Question: When you first read the script, what was the one scene you were like “Aw, man. I can't wait to see that when the movie's done!”? Wyatt Oleff: There's not really one scene in particular, but it's probably... I have a speech and it had a couple re-writes and the last re-write that it had I looked at it and was like “I'm so excited to do that!” It turned out really well, I hope. (gets okay from publicist to reveal more) Yeah, it's the Bar Mitzvah speech. It was my favorite scenes and I can't wait to see it on screen. Quint: One of the interesting parts to me about Ben's character is the hopeless romanticism that he has. He's got such a huge crush on Beverly. How do you play that? Did you try to play your crush broadly or keep it small? Jeremy Ray Taylor: I don't know. Throughout the movie I think “Alright, Bill is right for her.” He's right for her, but I know he can never love her like I can. I always try to keep it to myself. I never talk about it in front of her. I send her one postcard, but it's not from “me.” It's from a “secret admirer.” I never talk about it really. Quint: But are you thinking about that in every scene you play with her? Do you find yourself subtly looking at her or if she's in danger you're the first to step up to protect her? That kind of stuff. Question: What kind of horror movies do you guys watch? 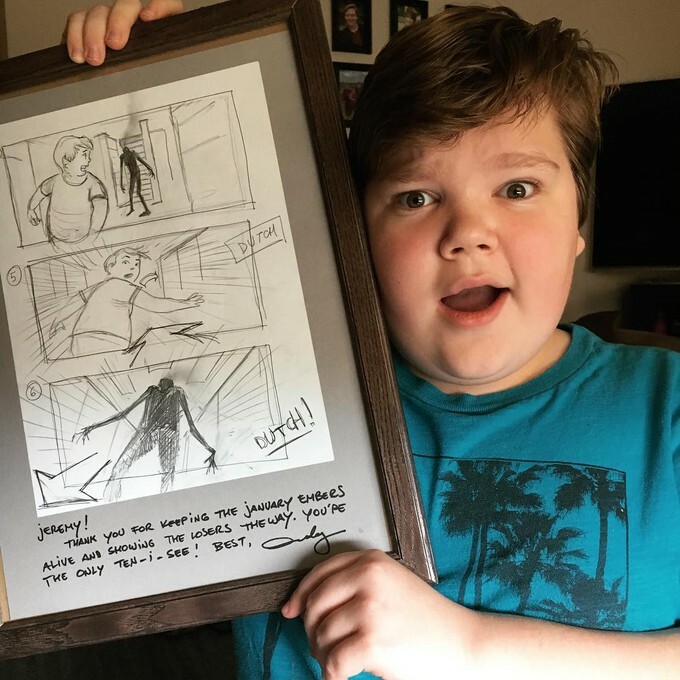 Jeremy Ray Taylor: I never watch horror movies! I get terrified of everything really easily. Question: So, you guys haven't seen Mama? Jeremy Ray Taylor: I haven't. Jack and Finn have, but I'm never going to dare to watch that. Question: Are you going to watch IT when it comes out? Wyatt Oleff: Well, you're going to. We're going to force you anyway. Jeremy Ray Taylor: Yeah. But Andy is the most amazing director, so I'm sure Mama is absolutely amazing. Question: In the book the language is very frank. Is it as well in the movie? Quint: Your vocabulary has expanded? Jeremy Ray Taylor: I haven't cussed yet. In the movie. Wyatt Oleff: Yes, you have. Jeremy Ray Taylor: No, I didn't cuss. I was supposed to, but I didn't. Question: Have you guys read the book? Jeremy Ray Taylor: I haven't, no. Question: Do you know what happens to your adult characters? Wyatt Oleff: (with a dead-eyed smile) Yes, I do. Question: So, for Stan... I mean, it doesn't effect how you play the kid, but what are your thoughts on that knowing what he does, ultimately. Wyatt Oleff: Well, there's a really good connection by the end of the movie where I'm cut right here (holds palm of his hand out). It's really focused, though, more like right here (just above the wrist), so it's kind of by my wrist, so it's kind of drawing that connection to what he does in the future. I've been told that I'm setting up the sequel, but I don't know how to respond to that. He's been scarred, I guess you can say. They're saying I've done that well. I don't know if that's a compliment or not, but Stanley is scarred mentally and physically by these marks (indicates wounds around his face) so they should appear in the sequel. That's what I heard. If that's happening. They're permanent, so every time he would look in the mirror he'd see it and be reminded about what happened. Eventually when he hears that IT's back, he can't take it. Question: Are you guys excited by the prospect of seeing what adult actors they'd get to play you? Jeremy Ray Taylor: Oh yeah, I'm so excited about that! We talk about it all the time. Quint: Who do you want to play your characters? Wyatt Oleff: Jeremy says Chris Pratt because his character gets all buff. Jeremy Ray Taylor: Yeah, I get all buff'n. Quint: One of the big moments for Stan in the book is a set piece in a Standpipe. Is that in this movie? Jeremy Ray Taylor: Never heard of it. Quint: Ah, in the book that's when Stan has his run-in with Pennywise. He's out birdwatching and ends up in a Standpipe with some dead kids. Wyatt Oleff: He gets it a different way. Hope you guys enjoyed that one. I especially dug Oleff's reveal of the nod to things to come during the blood oath scene in the movie. That's a very interesting detail and one I might have missed in the movie if he hadn't said anything. Make sure to check out the rest of my IT interviews. They're all over the page, so go seek 'em out! They're all solid!